You can put together this hearty soup by what is in your pantry. This makes a delicious Tex Mex soup that will fill you up. 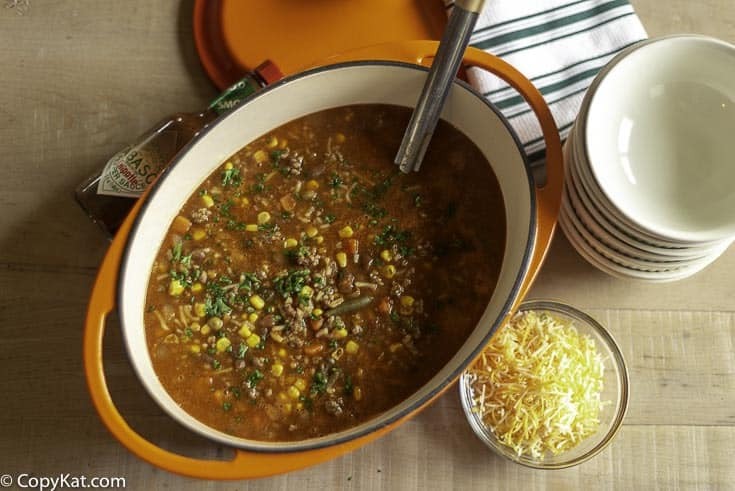 Why not round up your family for this delicious Tex-Mex homemade soup. You can put together this hearty soup using what’s in your pantry. This recipe makes a very tasty Tex-Mex soup that will fill you up. It’s a wonderful soup for a cold winters day and it’s also perfect for your next game-day event. Cowboys played an important part in the settling of the western United States. They worked on cattle drives, repaired fences and took care of the horses. Originally many cattle drives started in Texas and ended at the railroad in Kansas. Cattle drives meant hard, hungry work. Cowboys would rise early in the morning and “guide” the herd to the next night’s stopping point. A herd of about 3,000 cattle usually meant around a dozen cowboys. Plus there was also a trail boss, a camp cook, and a wrangler whose job was to keep track of the extra horses. In 1866, the first chuckwagons began moving from camp to camp in order to feed the cowboys. When you have to cook out of a chuckwagon, necessity is really the mother of invention. Many a meal for hungry cowhands has been thrown together from beef, beans and whatever else might have been at hand. A soup like this one must have been on the dinner menu for many a night around the campfire. City slickers will also want to slurp up every drop of this soup! Ro-Tel is a brand of canned diced tomatoes that includes green chilies. You can choose just the right degree of hotness and spiciness for your family’s taste buds. Whichever variety you opt for, Ro-Tel livens up otherwise ordinary dishes with the bold, festive flavors of the Southwest. Ranch style beans include a perfect blend of spices to create a unique, bold flavor that’s synonymous with authentic Southwestern cooking. If you don’t know where to find them, you can order them from HEB. Apart from soup, they go well with any kind of Mexican food or why not try them the next time you grill some steaks. 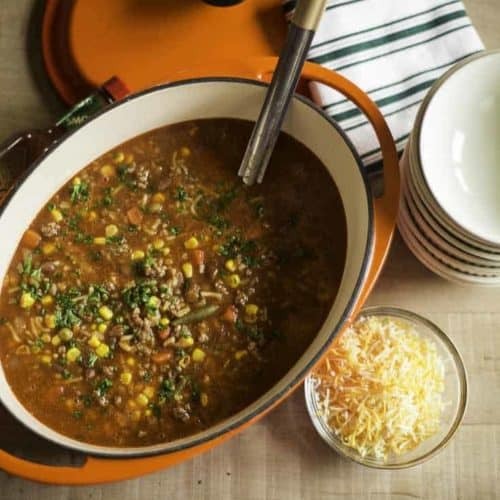 Enjoy flavorful cowboy soup when you make it at home. This easy soup recipe is hearty and filled with ground beef, tomatoes, and spices. For some added flavor, I love to add some cheese, Fritos, and a dash or two of Tabasco’s chipotle sauce. You can keep a bottle of hot sauce on the table so your family and friends can add just the right amount of heat to their bowl of soup. Some tasty cornbread will also go very well with this flavorful soup. Some Cornbread with Your Soup? Try these copykat cornbread recipes. Want a Couple More Copykat Ro-Tel Recipes? 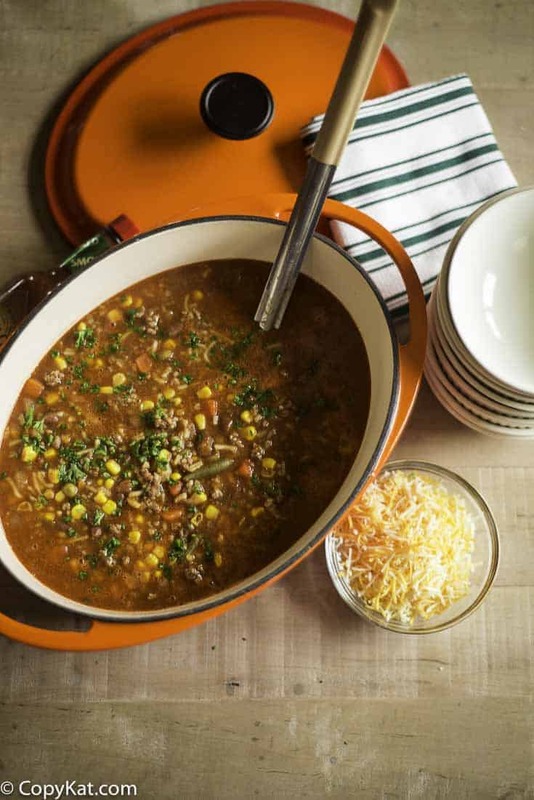 Enjoy flavorful Cowboy soup when you make it at home. Brown hamburger and onion together until well cooked. Drain well. Add the remaining ingredients. Do not drain any of the vegetables. If you like more broth you can add additional or you may want to add one cup of water and a bouillon cube. I love to add some cheese, fritos, and a dash or two of Tobasco’s chipotle sauce to this. This soup is amazing, I have eaten it since it was first posted on this site many many years ago and my mother got a hold of the recipe. Great for cold winter weeks.